When it comes to getting a break in the Music Industry there is no silver bullet. Instead there are multiple ways in. We caught up with three ex-students of Edinburgh College to find out how they got their first break in the music industry and the three things you should be doing if you want to succeed. One common thread that all three agreed on was the importance of getting hands on experience, mostly through volunteering or internships. “Volunteer as much as you can. Yes, working for free is not ideal but think of the impressions you can make to the right kind of people. It’s always great fun as well! I looked at it as investing in my future and it worked. Network as well, events such as Born To Be Wide give you the opportunity to meet people you wouldn’t normally get the chance to meet. I started by volunteering for The Great Escape in 2014. Getting stuck in and showing dedication resulted in a paid internship with them in 2015. From this I have made many connections in the industry. One of which offered me a job working with Mama and Co’s festival production team over the summer which in turn put me on the radar for work in Wales”. So rather than just say you have a passion for music- demonstrate it somehow. Show you are engaged with the industry and have a bit of a spark. Think what really makes you tick in terms of the industry and do something related to that: start a new music blog, put on a gig night or offer to help manage a local band. 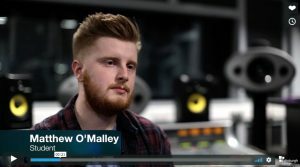 The head of HR for Universal Music and in a recent article in the Guardian emphasised the need for people who want to get into the business to get to grips with how the industry works and what the range of different opportunities that are out there. It is a complex, fast moving, ever changing industry and it is crucial you get up to date with what is happening in the industry and the changing trends. “The best advice I can give students who would like to work within the industry is network. If you don’t network you don’t get work. Two of the best things I went to while studying was Born to Be Wide and Wide Days (Scottish music networking events based in Edinburgh) which I discovered through Edinburgh College. Sometimes the topics weren’t always ones I was interested in, but I ended up meeting a lot of inspiring people and people who have helped me get to where I am now. i) Get experience whether it is voluntary or funded- this could range from volunteering at a festival or networking event to paid internships with a record label like Universal or Sony. Alternately you could do it yourself and start your own label or blog. ii) Get to know the industry (and the opportunities that are out there): You can study at college or university to do this and at the same time start to get some experience, build up your network and your CV. iii) Network: Attend as many networking events and conferences as you can. You can make lots of useful contacts or find out about opportunities that you didn’t know were available.